This is the sheet music for “A Thousand Years” by Christina Perri – as arranged and performed by Carlton Forrester. I listent to this music again and again, just can’t stop, it’s so beautiful, at last I buy the sheet and try to play it myself, keep doing this great job!! 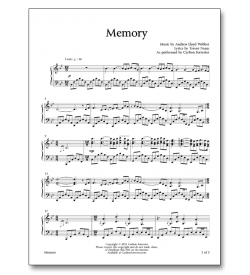 Wonderful piano piece. My daughter loves playing all your songs! Please keep them coming!! Mina, for a few bucks isn’t it worth it to pay for wanting to play “so much”? Free is for worthless people that strive to do nothing….get a job! I thought it was a free download………….where can I get one without paying? Please I want to play this so much.